Kristina Halvorson (“Content Strategy for the Web”) touts what she calls “page templates” and “page tables” that focus on key messages, content requirements and source-content quality, and recommend how content should be created and maintained post-launch. Erin Kissane (“The Elements of Content Strategy”) offers a similar “content template” tool designed to communicate content requirements at the page level, and specific directions on messaging, tone of voice and other guidelines for content developers after wireframes are finalized. 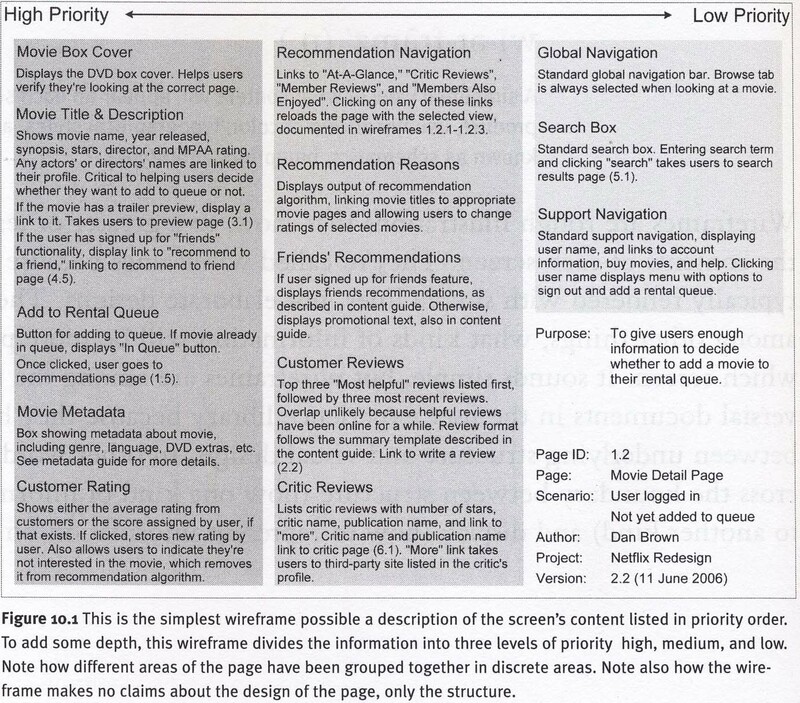 Dan Brown, an information architect and author of the highly practical “Communicating Design—Developing Website Documentation for Design and Planning,” recommends a tool he calls a “page description diagram” which prioritizes page content (including images and visible functionality) on a scale of 1 to 3. He emphasizes that one of his main goals in developing the tool was to suggest content priorities without specifying actual page lay-out, leaving that for an information architect or other designer to work out later, in detailed wireframes. So far I’ve only used Brown’s diagram template (see below, an example from his book), but it’s been a hit with designers, if only because they haven’t had time, or seen it as part of their role, to familiarize themselves much with content and the site owner’s messaging priorities. Read more from me about wireframes (a long-time obsession of mine) here.